I was so excited for my first full day of BlogHer that I was out of the room by 7 am and hit Starbucks for caffeine. I met my first contact, Elizabeth Edwards (not that one) who writes at Table for Five. 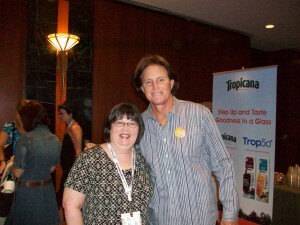 She’s a BlogHer veteran and super friendly. Deb on the Rocks welcomed the newbies very humorously. 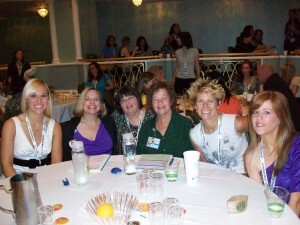 She noted that each person will have a different BlogHer experience but they’re all just as valuable. I can see that happening already based on what events people attend. 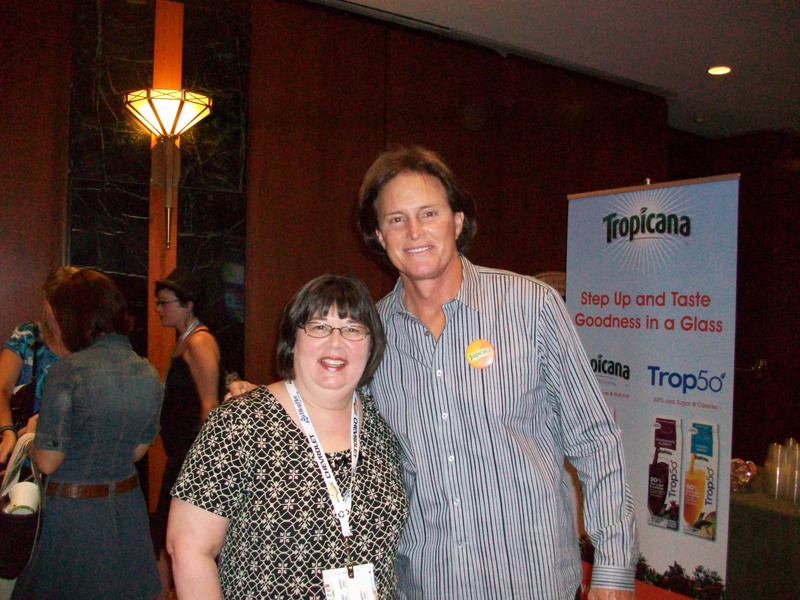 We then headed to the opening keynote where I ran into a line for meeting Bruce Jenner. He was very personable and chatted with all the bloggers asking questions. I mentioned to him that I saw him win gold in 1976 to which he replied, “someone who knows I did something other than raise kids”. 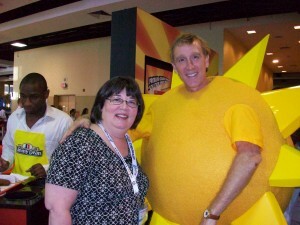 We had time after the opening keynote before the first session so I headed over to the expo. There were so many exhibits it took up two floors. Like Disneyland most people headed to the first things they see which was the entrance to the first floor so I took the escalator to the 2nd level and got to see the Jimmy Dean “Sun” right away. I had my picture taken with Dora the Explorer, My Little Pony, Hamburger Helper hand, a milk mustache and Marmaduke. I’ll spare you from having to see all of these. There were so many booths with all kinds of products ranging from milk to water filters. Proctor and Gamble built an entire “home” with products and activities in each room. I ended up spending most of the morning on this floor and the afternoon on the first floor. 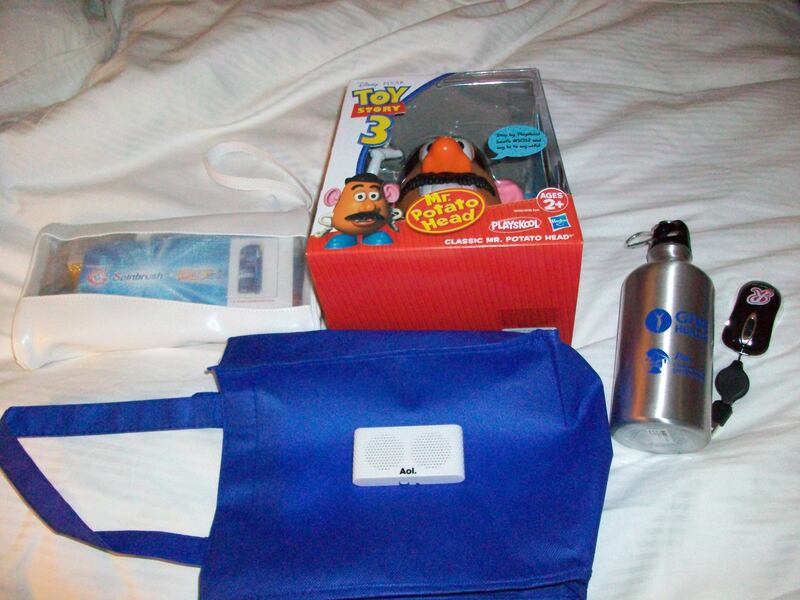 About 6 or so exhibitors had suites where you could get a pedicure (Ecco shoes), roast a s’more (Hershey), taste new products (My Blog Spark) or get a cute t-shirt (Firefox). I had registered in advance for a couple of swag bag pickups that had specific times. 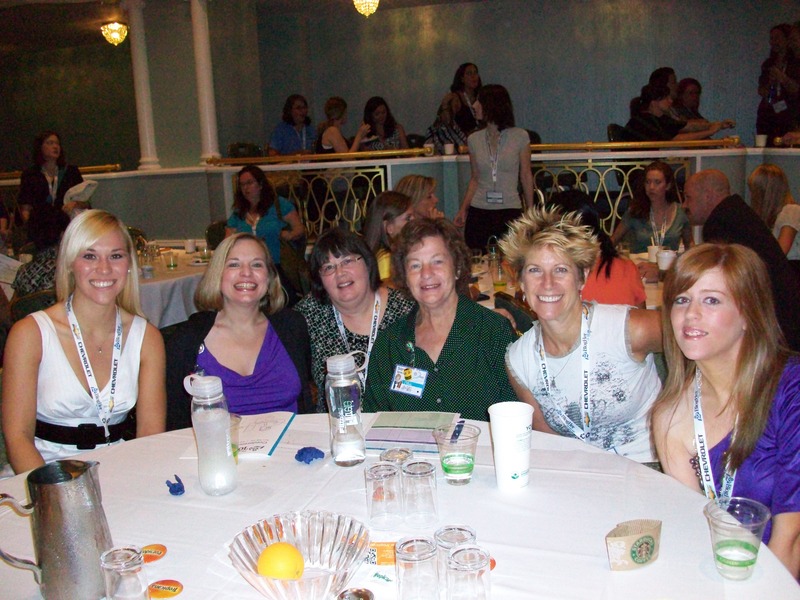 The first one was organized by MomSpark (where there are excellent forums to prepare for conferences). The second was Sweets in the City at the Sheraton and sponsored by The Big Toy Book. 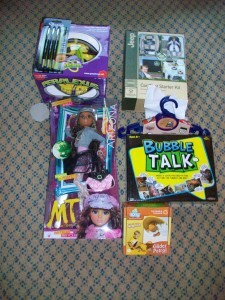 I have so many Christmas gifts taken care of from the gift bags and great toys! Tavern Direct hosted blogger dinners several nights and we attended on Friday evening. This specialty foods vendor, focusing on balsamics, shares a significant amount of proceeds with the National Center for Missing and Exploited Children. The 4 course dinner with wine was excellent and they provided transportation back and forth from the Hilton to Ponte’s Restaurant. Very nice people and great cause. I’ll write about bloggers and causes in a later post. At the hotel we stopped in at the Gala Party. Registrants for the party received drink coupons and you could buy more if needed. We enjoyed listening to kareoke. These women could sing! Tomorrow was going to be an early day so I called it an evening at 10 pm although the party was going much longer for some. 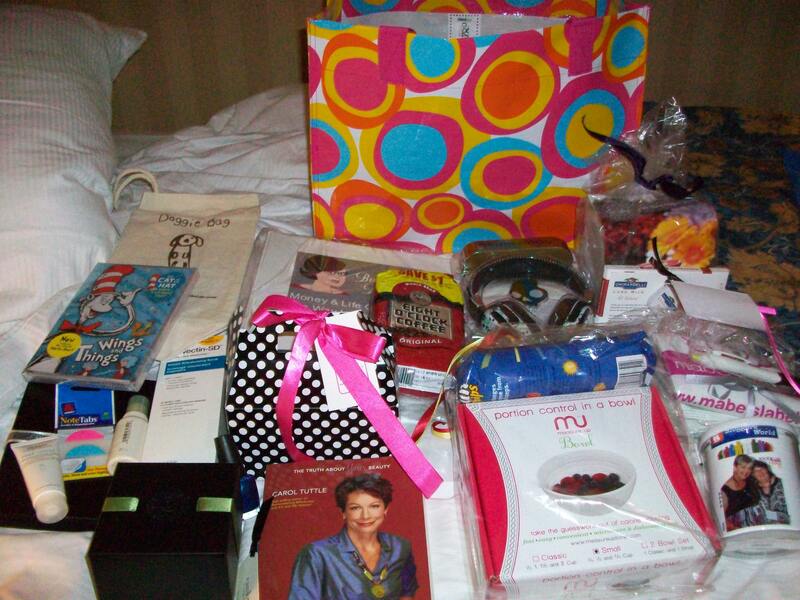 I’ll leave you with pictures of a portion of the swag collected. What was Bruce Jenner’s message to y’all. Seems kinda random he was there no? Sam, I don’t there there was a specific message. Tropicana and Pepsi paid him to make a breakfast appearance and then a expo booth appearance as a draw for attendees. Padma Laksmi was also at the expo hall one day. Little House, the confernce next year is in my hometown so it won’t work to make one trip! However, I hope you can make it to both. Hi Kay Lynn, After reading about your exploints on google reader, I had to stop by to say HOW COOL your adventures are. It seems so fun to learn from other bloggers. It’s so different than sitting in one’s living room typing away. Can’t wait to hear more. This has been a great experience. The real lesson of “swag” is that bloggers have earned power through our voices. We need to figure out the best way to harness it and use it to our advantage. Jackie, I’ll put all the pictures up on flicker and let everyone know so you decide then if you want to see them all. I figured I should pose with them all. There’s no law that we have to show anyone, LOL. I loved meeting you and hope to see you in my hometown next year. I don’t think we did meet; too bad! The pedicures looked great but I just had on at home before leaving. Loved admiring the shos, though! Thanks for coming by. 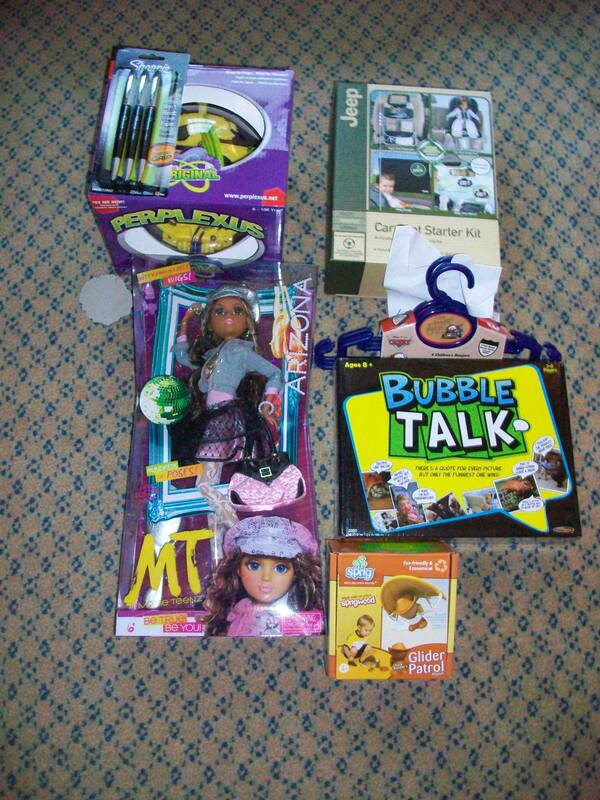 Thanks so much for coming by The Big Toy Book’s Sweets In the City event! We have a great picture of you decorating your wine glass on their facebook page! Corine, thanks for letting me know. It was fun looking at all the pictures and reliving the party.